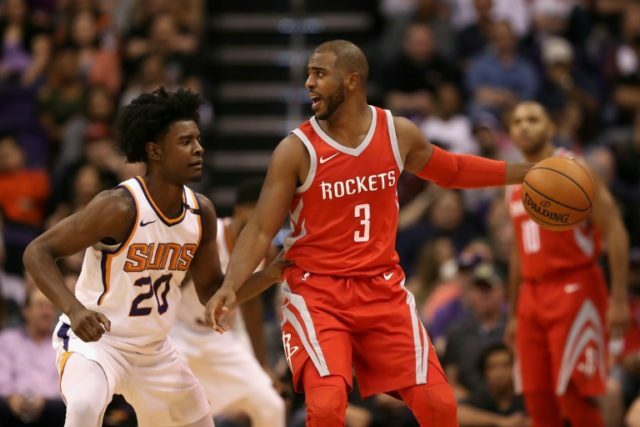 Los Angeles (AFP) – Chris Paul scored 25 points as the Houston Rockets overpowered Russell Westbrook’s Oklahoma City Thunder to tighten their grip on the Western Conference with a 16th straight victory on Tuesday. Paul produced a scintillating display of shooting which included five three-pointers to help the Rockets bring up their 50th win of the season, a 122-112 victory. Houston now lead the West at 50-13, one game ahead of the Golden State Warriors who defeated the Brooklyn Nets 114-101 on Tuesday. The Thunder, meanwhile, remain firmly in the battle for one of the lower-seeded playoff spots, lying seventh at 37-29. Against the Rockets, the talismanic figure of Westbrook once again led the way for the Thunder with 32 points while Carmelo Anthony finished with 23. Paul George had 17 points while New Zealand’s Steven Adams chipped in with 16. Houston’s greater depth in offense, however, was to prove decisive, with seven players cracking double digits. MVP hopeful James Harden was happy to take a backseat to Paul, but still managed to come up with 23 points, 11 assists and five rebounds. Harden meanwhile warned against complacency as the Rockets targeted a strong finish to the regular season. “We’ve still got a long away to go, especially these last 20 games or whatever we’ve got left,” he said. Thunder coach Billy Donovan bemoaned his team’s tendency to concede cheap turnovers. “We turned the ball over too much, both halves,” Donovan said. “We need to do a better job of taking care of the basketball. In Oakland, Stephen Curry scored 34 points as Golden State eased past Brooklyn at the Oracle Arena. Kevin Durant had 19 points with Klay Thompson 18 and Draymond Green 16 to maintain the reigning NBA champions’ pursuit of Houston. In Los Angeles, Anthony Davis exploded for 41 points as New Orleans edged the Clippers 126-121 to claim a ninth straight win. The Pelicans improved to 37-26 with the result. In the Eastern Conference on Tuesday, DeMar DeRozan led the scoring as the Toronto Raptors notched a fifth consecutive victory to remain firmly on top of the standings with a 106-90 romp against the Atlanta Hawks. The Raptors improved to 46-17 with the win, helped by Jonas Valanciunas contributing 15 points and CJ Miles 14 off the bench. Serge Ibaka and Delon Wright also made double figures with 10 points apiece. John Collins and Kent Bazemore each made 14 points for the Hawks, but the visitors were unable to prevent a sixth defeat in eight games. Atlanta remain rooted to the foot of the Eastern Conference with a 20-45 record. In Charlotte, Robert Covington led an all-round scoring display from the Philadelphia 76ers in a 128-114 defeat of the Hornets. Covington scored 22 points for the Sixers, one of seven players to finish in double figures for the visitors, who improved to 35-28 and remain sixth in the standings. Dario Saric had 19 points while Joel Embiid snared 18. Australian star Ben Simmons got 16 points with 13 assists and eight rebounds. Charlotte fell to 28-37 in the defeat. In Washington, Bradley Beal had 30 points while Markieff Morris exerted his influence as the Wizards maintained their playoff push, winning 117-113 over the Miami Heat. Morris had 16 points with 13 rebounds to help the Wizards improve to 37-28.